Whether we are talking about the Registered or the Commercial cows, our focus has and always will be on maintaining a highly productive cow herd. 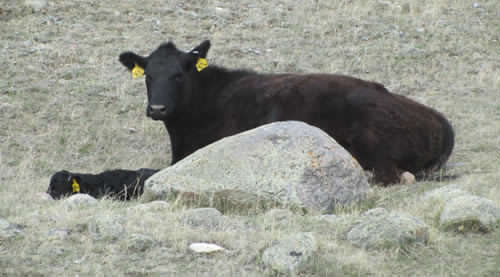 Fertile, sound females which will, in turn, produce quality replacement heifers (that will make functional, consistent producers for many years), without sacrificing feeder steer quality. Our cows have milk! We hold milking ability high on the "good" list. Without it those calves are just not going to grow. After all what good is breeding for growth and performance if the cow is unable to sustain the calf through the first 6 months? Free-moving and sound. You bet! We don't trim feet. And they have to be low-maintenance and easy-keepers. Our summer pastures average 2 sections in size with water holes at a minimum. With the majority of our grazing fields having a stocking capacity of seven pairs per quarter, they have to be efficient cows that will go out and compete for a living, while producing offspring that have rapid growth and early maturity. Correct and eye-appealing. These black-wrapped attractive cows come with all the length, depth, and thickness they can fit into a moderate framed, feminine package. Qualities, as you are well aware, that are needed to produce growthy steers with superior feed conversion and marbling ability. or straight-bred programs of commercial cow/calf producers. The proven mother cow is the fore front of our program. Over six decades of Black Angus experience allow us to market top quality steers and superior replacement heifers from a herd of 400 cows. 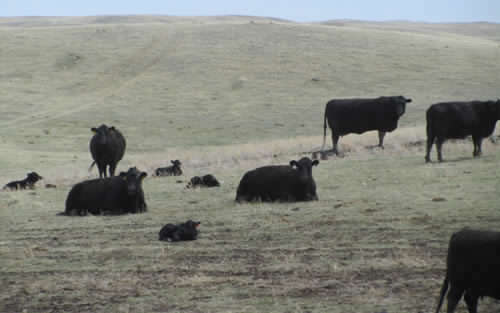 The calving season for the commercials begins with the first-calf heifers in late March, followed by the main herd, two weeks later in mid April. 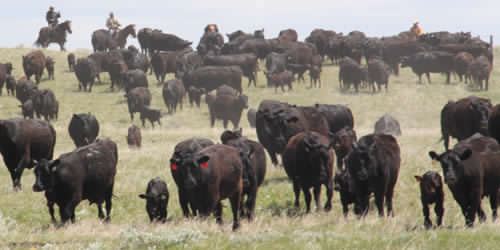 In late May, we begin moving them to the summer pastures which consist of native shortgrass and some tame grass. The cows with steer calves are summered in one area and the cows with heifer calves in another. Following weaning, the cows are kicked back out either to native shortgrass or stubble until they are brought home to the winter field. Here they are fed baled green-feed and a grass/hay roughage. A free-choice mineral supplement as well as access to stacked chaff, saved from harvest, is also offered. A herd health program is followed, as recommended by our Veterinarian. We offer all three for your appraisal. This is an open invitation to drop in and visit. See first hand the large selection of breeding and performance potential that we have in our present herd. A commercial Black Angus breeding program which continues to benefit from the vast and varying experiences of four family generations in the cattle business. 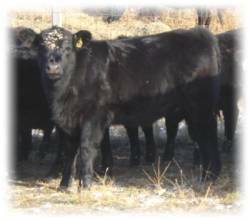 In 1948, Connie's Grandparents, Ole and Esther Wardberg, purchased 8 registered Black Angus females, and Angus have been continuously bred and produced since that time. Give us a call and stop by for a tour and visit. Please do not hesitate to CONTACT US if you have further questions concerning our cattle program. Those 8 females set a precedence for the remaining years, thus becoming the foundation for Connie's parents, Alfred and Jo Wardberg, ourselves and now the fourth generation, our son and his family; Darby and Sarah. These cows are all retained replacements from our own breeding program. 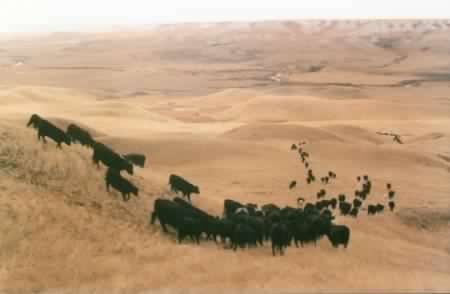 Since 1984, Registered Black Angus bulls have made up the entire herd bull battery that sires our own replacements for the future cow herd.